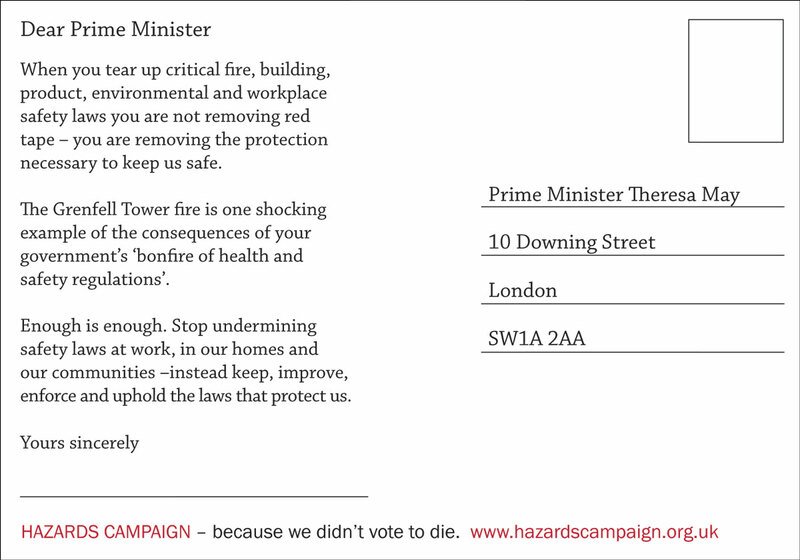 The Hazards Campaign believes the British health and safety system is broken. Workers are harmed daily just for going to work to earn a living, and many now have no realistic prospect of enforcement of their basic human right to go to work and come home alive and well. Develop a health and safety system based on prevention, precaution and participation of strong active unions. 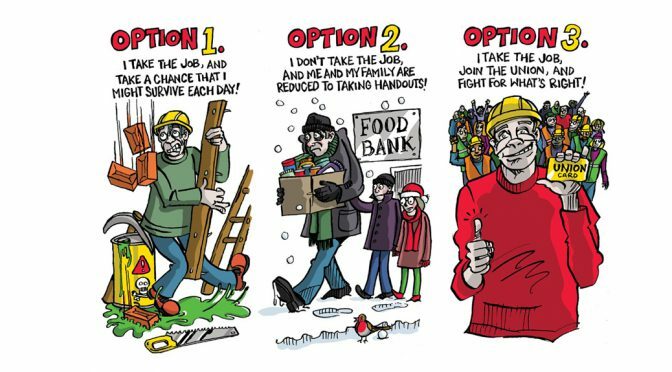 Provide real, enforceable employment and safety rights to ensure good health and safety in low paid and precarious work by enforcement agencies working together. “The Manifesto is a clear guide to action that must be taken to protect all workers by restoring good regulation and enforcement, revamping the independence, funding and action of the HSE and Local Authority enforcement agencies, empowering trade unions and safety reps who have the biggest impact on making work safer and healthier, and ensuring links between health and safety and employment inspections to deal with the exploitation of workers in the low paid, precarious economy. “We call for increased enforcement with more resources, and more, more accessible inspectors, employment rights with collective representation from day one on the job, and an end to zero hours, precarious work. An end to all the lying, dishonest, unevidenced rhetoric used to justify the deregulation of health and safety. A large body of evidence shows that Unionised Workplaces are Safer Workplaces . Through workers organising together in unions they can fight for safer, healthier and decent work for all. Collective action and elected safety reps create the proven ‘Union Safety Effect’ making workplaces twice as safe.1 In 2018 we are celebrating 40 years of the Safety Representatives and Safety Committee Regulations, SRSCR, which give elected union safety reps the powers and functions to hold employers to account, challenge them and work with them to make work safe and healthier. In GB, Health and Safety Executive, HSE, annual figures of 137 deaths at work in 2016/17 only covers those reported to HSE and Local Authorities. It excludes members of the public killed in work incidents, workers killed on roads, at sea, in air and by work-suicide. The figure also excludes those dying because of bad work conditions from cancers, heart, lung and other diseases. Using expert research, the Hazards Campaign estimates a more realistic figure for those killed in work-related incidents is 1,477 and those dying of work illnesses as 50,000 per year. That is around 140 people dying from work per day or one person every 10 minutes in GB. The UN ILO estimates 2.78 million people worldwide dying from work every year up from 2.3 million in 2014. One person killed by work every 11 seconds worldwide. Safety Reps saving lives at work for 40 years! This year we celebrate the birth of the TUC, established at the Mechanics Institute at a meeting called by Salford and Manchester Trades Union Councils 150 years ago, as well as the 40th anniversary of the Safety Representatives and Safety C/te Regulations, one of the most important laws for workers’ lives and health but one that has been almost totally unenforced. Workers began organising in Trade Unions 150—200 years ago, to improve health and safety in their own workplaces and through political action to win wider legal changes and protections. By educating agitating and organising and acting collectively, unions gained a shorter working day, more time off work, reduction in exposure to chemicals, dangerous machinery, an end to child labour and exploitation, and won stronger social protection laws and stricter enforcement, as well as fighting for higher wages. It’s not about asking for improvements but having the collective voice and industrial power to demand them. The TUC has collected Safety Rep success stories 6 which add to the massive body of evidence shows that union organisation and safety reps do make work safer, save lives, save health, and save money for employers and the economy—up to £700 million per year proving that good health and safety is not a burden on business, or a job killer but a positive contribution to our human rights. Poor health and safety costs, on Hazards estimates, between £30 and 60 billion per year. 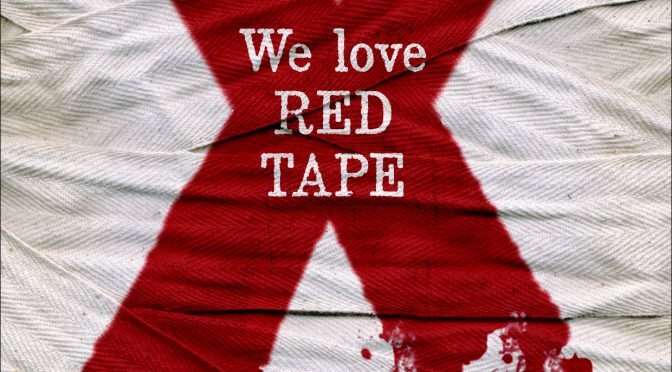 Despite all of this evidence, since 2010 government has attacked health and safety law and enforcement as ‘red tape’, employers ride rough shod over laws and fail to comply, and the Trade Union Act makes it harder for unions to protect and defend workers health. A big cut in funding enforcement led to far fewer preventative inspections and enforcement actions on non-compliant, criminal employers, so increasingly it is down to Safety Reps! 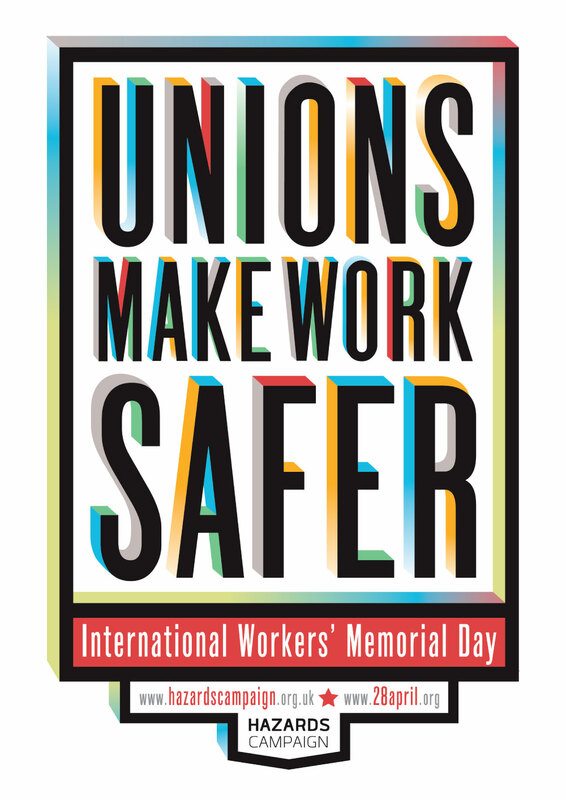 Use #IWMD to fight for our lives and join together in unions to make work safer ! In GB there are around 1,500 deaths from incidents and 50,000 from work illnesses, over 621,000 injuries and millions made ill by work every year. 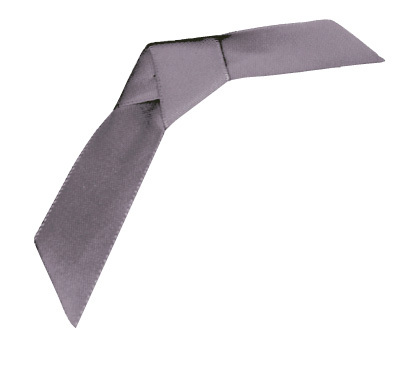 Almost all work deaths, injuries and illness are due to employers’ mismanagement. Inequality and discrimination at work mean that the most vulnerable workers—the poorest, women, young, ethnic minority, migrant, LBGT and non unionised workers— are at more risk of being made ill, injured or killed by work. 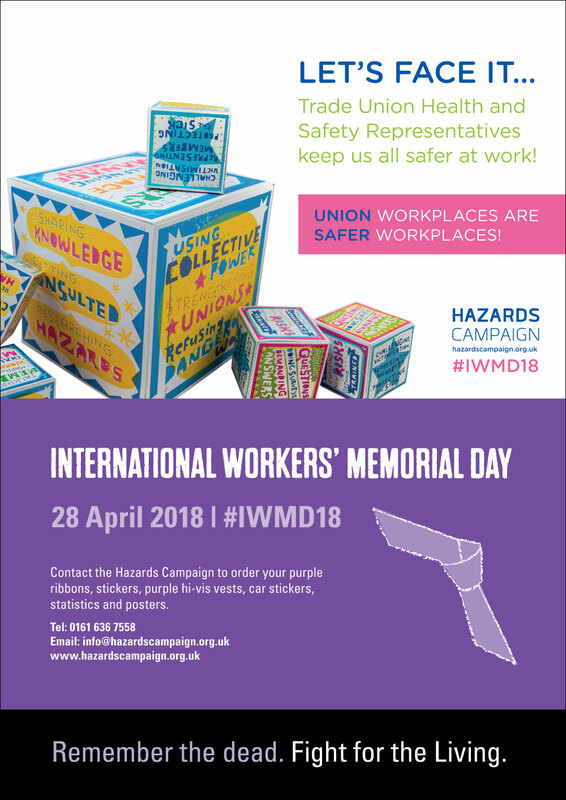 What you can do on #iwmd18 Big Up Unions! Use the Resources to shout loud and proud that UNIONS MAKE WORK SAFER and take action to strengthen your union organisation or create a union at work. Workers’ Memorial Day is on 28 April, consider how you can best use local media both before & on the day. 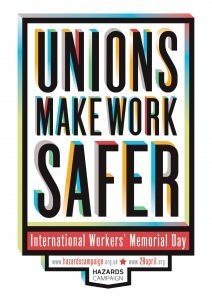 Tweet about your workplace union health and safety successes use internationally unifying hashtag #IWMD18 and check it for new resources and retweet. These words are “for every last soul” who perished at Grenfell, and are spoken by Stormzy at the start of the Artists for Grenfell single. They could just as easily have been spoken by FACK families. We will never forget our lost loved ones and ask that you don’t either. Instead, in their memories, devote your energies to fighting for the living. We want the chorus of disapproval to reach a crescendo. 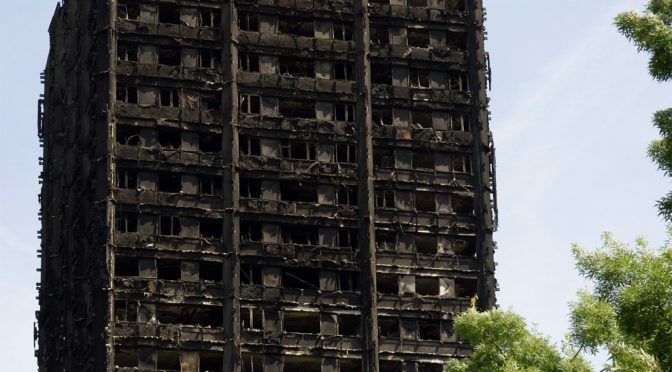 Opening and closing with the vision of the charred tower block, the music video which accompanies the Grenfell single can’t fail to touch hearts. And all too often, it is music which evokes memories to tear at a FACK family’s heart, just as a line from the Verve’s “The Drugs Don’t Work” does for Samuel Adams’ mum: “But I know I will see your face again”. Sam was 6-yrs-old when he went for a family day out to the Trafford Shopping Centre and his face was only to continue to be seen in photos and preciously held memories. Frankie Miller singing “Let me tell you that I love you, that I think about you all time” transports 26-yr-old Michael Adamson’s family and friends back to the devastation of the walk from the crematorium. Welsh hymn Gwahoddiad is the one guaranteed to reduce Andrew Hutin’s parents to tears, the one that raised the roof of the chapel at the funeral of a young man who had only recently turned 20 when a tidal wave of molten metal exploded from a blast furnace. Fundamentally wrong that these young men were taken from their families, denied the opportunity to live their lives. And why? Because still far too often health and safety is wrongly seen as a burden, red tape, a tiresome impediment to getting a job done, or a costly barrier to making a profit. The firefighters whose emotions overwhelmed them on being clapped and cheered by the local community at Grenfell – that community knowing they had done all they could, and more, to save lives. Those who have had the courage to speak out about perils faced by themselves and their colleagues, finding themselves blacklisted as a result. Those who work in our Hazards Centres – in Manchester, London and Glasgow – seeking to prevent work-related harm, committed to improving workplace health and safety. And trade unions safety reps whose life-saving work often goes unnoticed, but whose work needs to be celebrated and built upon. Because, let’s be clear: a union workplace is a safer workplace. These are the people who prevent injury, illness and death; who prevent suffering and the consequent need for a soundtrack to tears. They are the ones with whom we must ensure chords are struck. Because, yes, perhaps a song brings into firm focus a happy moment caught in time…running bare foot from a tent at a bike rally in Edinburgh on hearing Born Slippy by Underworld, Graham and Karen to be the only ones dancing and grinning in the rain. But Natalie, Dionne, Sharon…they are among those who’d “love, love, love to dance with their fathers again”, who are destined to do so only in dreams. The dreams and the plans that had been hatched by Linzi and Herbie during long nights spent listening to The Rock from The Who’s Quadrophenia, were not to become reality. Instead, in the aftermath, songs that filled the void “at the dimming of the day” bring into dark focus the utter desolation. Just what would Dorothy and Douglas give to hear Mark belting out again: “I gotta take a little time…In case I need it when I’m older”. He wasn’t to get any older than the age of 37. Another of his favourites was “I want to live forever”. We know that no-one lives forever. But, work should be life-changing in a positive way. It should never ever be life-ending. FACK facilitator Hilda Palmer has quite rightly described Grenfell as an “Enough is Enough” moment. And the death of each of our loved ones was our own personal enough is enough moment. Let us repeat: lack of good health and safety leads to loss of life equivalent to two Grenfell towers each and every day in this country. Enough is surely enough! By Louise Taggart Founder FACK member, sister of Michael Adamson. 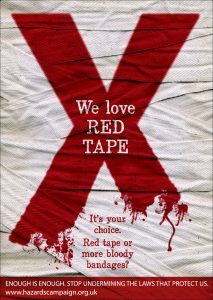 FACK was established in July 2006, by and for families of people killed by the gross negligence of business employers, see www.fack.org.uk .